I've got to say, I had a hard time deciding whether I should write about Final Fantasy, Final Fantasy IV or Final Fantasy V here. Why? Well, as far as the original Final Fantasy is concerned, it was the first console RPG that really grabbed me. I played Dragon Warrior (Dragon Quest now days) before Final Fantasy and liked it well enough, but I preferred Square's effort to Enix's in almost every way. Specifically, I liked that Final Fantasy provided players with four-person parties--a far cry from Dragon Warrior's solo mission. Also, players could assign classes or "jobs" to party members at the start of the former, while they were stuck with a seemingly generic "hero" in the latter. Add in Final Fantasy's visible weapons and spells--neither are present in Dragon Warrior/Quest--and it should be easy to understand why younger me found Square's 8-bit RPG so fascinating. Still, I wouldn't say Final Fantasy turned me into an "RPG fan." 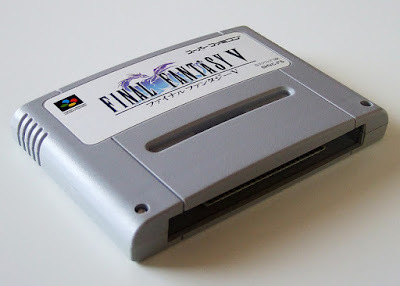 Sure, I liked the genre a whole lot more after I played through that game than I did before I played through it, but platformers and shmups continued to be my go-to genre until, well, the release of Final Fantasy IV (Final Fantasy II in my neck of the woods). 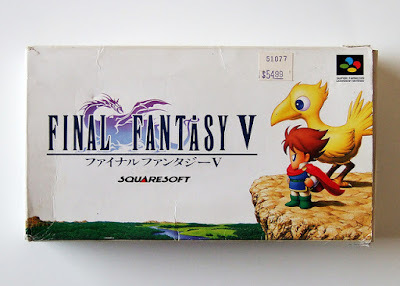 Speaking of Final Fantasy IV, although there's no question it pushed me further into "RPG fan" territory, it didn't really shape my taste in games--role-playing games or otherwise--moving forward. Yes, I adored the first 16-bit entry in Squaresoft's Final Fantasy series, but if I'm allowed to be honest, it mostly just beefed up the superficial components of earlier Final Fantasy games. And in terms of its gameplay, it could be argued that Final Fantasy IV regressed a bit (or a lot) from its Japan-only, Famicom-based predecessor. Final Fantasy V, on the other hand, seemed to my teenage self to be a real evolution from the titles that came before it. OK, so I couldn't fully understand its story at the time, but it resonated with me all the same. I especially appreciated how it featured a character--Faris Scherwiz--that defied gender roles. I also found myself in awe of Final Fantasy V's soundtrack, which has always struck me as being more wistful than that of your average RPG. This game's story and soundtrack weren't what influenced my taste in video games, though. So which aspects did? The best example I can offer up is its expansive job system. Final Fantasy III featured a similar (albeit less impressive) system, but I didn't play it until the DS remake was released in North America in 2006. 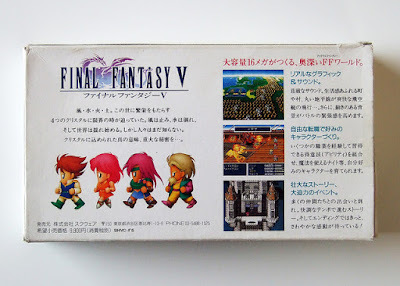 I especially loved how the Final Fantasy V job system allowed you to mix and match classes and skills. Want one of your party members to be a White Mage who can wield an axe? Spend some time as a Berserker until you've gained the "equip axes" ability and then make use of it after you switch over to the White Mage job. Or maybe you want someone in your party who can use a pair of bells in battle? Have him or her take on the Ninja job until they've learned the "dual-wield" ability and then enable it as a Freelancer--especially after they've acquired, say, a Rune Chime and a Tinkerbell. Another way in which Final Fantasy V helped shape my taste in games: it solidified my love of RPGs that feature bevy of weapons that are visible in battle. I first became aware of that interest after I acquired the coral sword in the first Final Fantasy, appropriately enough, but it wasn't until I experienced Final Fantasy V's plethora of axes, bells, hammers and harps that it blossomed into a full-on obsession. Were any of you similarly influenced or enchanted by this 1992 release? If so, share why and how it impacted you in the comments section of this post.